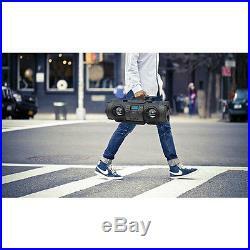 Supersonic Bluetooth Portable Bazooka Boombox MP3/CD Player/FM/USB/AUX/Remote. This cool looking audio system comes package with Bluetooth allowing you to wirelessly play Bluetooth enabled devices and a 3.5mm auxiliary input jack allows you to connect almost any external device through the auxiliary jack. The unit’s spaker delivers high performance digital amplifiers and drivers to give you a distortion-free sound. Portable Wireless Audio System. Front Loading CD/CD-R/CD-RW/MP3/WMA Player. Built-In Bluetooth (wireless connection to other devices) allows your audio system to work with Bluetooth enable devices. Volume Control and Bluetooth Connect Buttons are conveniently placed for easy access. Allows wired connection through its 3.5 mm AUX-in port for other portable devices without Bluetooth. Complete Portability allows you to use your unit indoors and outdoors. Built-In Bluetooth 2.1. Built-In USB Input allows you to play external devices. Karaoke Function with 2 Microphone Inputs. 8W x 2 RMS Output Power. Subwoofer Function (28W Output Power). EQ & Mute Function. 3 Color Illumination on speakers. DC 15V Input allows you to use your audio system in the car. AC Input: 127V 60Hz. Battery Operated (10 x D) 1.5V. Full Function Remote Control. Accessories: Line In Cable, Micro USB Charging Cable, 3.5mm AUX Cable and 3.5mm to RCA Extensions Cable. Box Dimensions: L 24.75 x W 10.75 x H 10.25 in. Weight: 11.85 lbs. We are a wholesaler bringing unbeatable service and price to our customers for 25 years. The item “Supersonic Bluetooth Portable Bazooka Boombox MP3/CD Player/FM/USB/AUX/Remote” is in sale since Saturday, May 16, 2015. 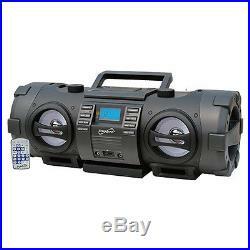 This item is in the category “Consumer Electronics\Portable Audio & Headphones\Portable Stereos, Boomboxes”. The seller is “jtidirect” and is located in San Diego, California. This item can be shipped to United States.